Salwar Kameez is a type of clothing which is wears by both men and women but the only difference is that men mostly wear plain salwar kameez while women wear decorated one. The other difference is that women also use shawl or dupatta with salwar kameez to cover their head and neck to show respect to their elders. With the change in time, salwar kameez also gets more modern looks. Now a day’s salwar kameez become more fancy and stylish. 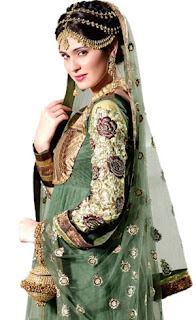 Modern salwar kameez generally include stylish necklines, transparent fabrics, and daring cuts. These changes make salwar kameez a more fashionable outfit for all type of occasion such as wedding etc. Now a day’s women usually wear kameez over jeans, slim pants or leggings and a scarf or stole as a substitute for the dupatta for a different look. Shalwar kameez (also spelled shalvar kameez, salwar kameez, or shalwar qameez); is a traditional dress worn by both women and men in South Asia and Afghanistan/Central Asia . Shalwar or salwar are loose pajama-like trousers. The legs are wide at the top, and narrow at the ankle. The kameez is a long shirt or tunic. The side seams (known as the chaak), left open below the waist-line, give the wearer greater freedom of movement.